The area of a triangle is simple you just need to know a formula, and then just know the parts that fit into the formula so that you can solve it. So let’s look at the formula. 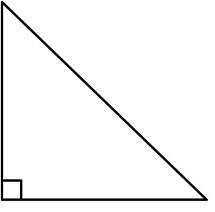 The area of a triangle is one half the base times the height and that represents the area. So H is our height, but our height is really an altitude drawn from the peak down to the base which is the reference side of that altitude touches. When you have a right triangle the one half times base times’ height is so simple. So let’s do that one first. We have a side of three and notice we have a right angle here. So that means that is the same as my altitude or my height. So three is my height so I will plug 3 in for my H. It touches the side that is the base of 4 so 4 is my base. So I will multiple 4 times 3 to get 12 and then half of 12 is 6 So the area of this triangle is 6 units.